Beautiful Spacious Two-Story Beach House ~ Private Pool ~ In Seagrove Beach! Vacation in style! 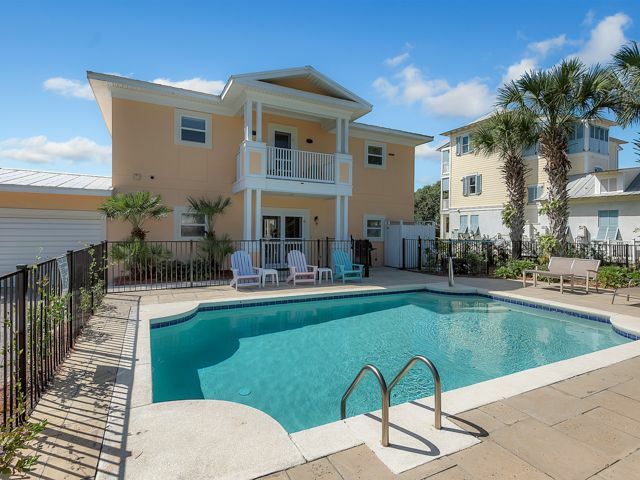 This great two-story beach house is located in beautiful Seagrove Beach, just a bike ride from famous Seaside along Scenic 30A. Not only are you steps away from sugar white sand, this house also features a large inviting heated pool. The cheerful first level has three bedrooms plus a cozy gathering area and wet bar. Out the front door is a nicely landscaped yard with room for little ones to play. An open wooden staircase joins the first and second floors. The second level features an oversized kitchen with a curved granite bar, living and dining area and the master bedroom. Second level on one side has a balcony overlooking the pool and on the front side you can relax with a cold beverage on the huge porch that gives a wonderful view of the gulf. WiFi Internet access, 6 flat screen TV's, HD cable. * Parking for 3 cars. We really enjoyed the location of this house; close to Seaside and to the beach! The pool was awesome! I was a little disappointed in the house itself. It could definitely use some updates. The carpet in he bedrooms and the tile flooring in the bathrooms have seen better day. For the price, I expected a little nicer interior.